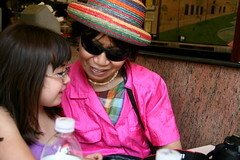 Alas, I am not a nosy mom and whatever secrets Dova whispered to my mom will stay between them. I'm fairly certain that it was nothing earth-shattering! 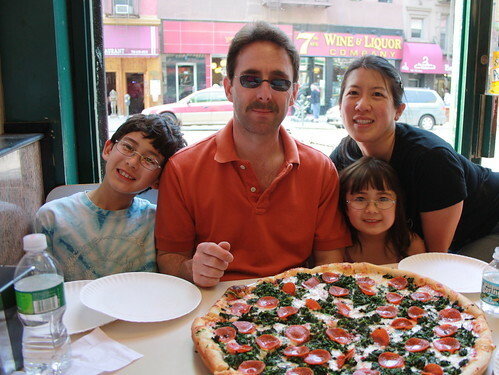 But I will tell the story about how we happened upon the best pizza place where this photo was taken. After the wedding we attended, we were supposed to join the new couple for brunch the next day at Prospect Park in Brooklyn, NY. After wandering around for a while, we never met up with them. I was pretty hot and cranky and didn't even take my camera out. 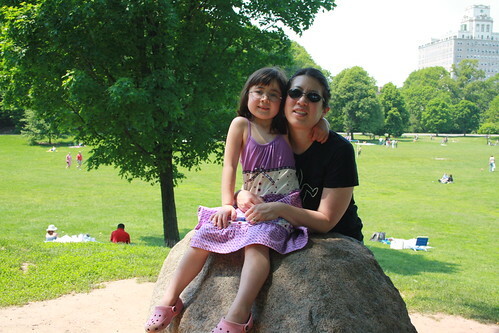 Here is cranky Angela taken by her mom. It was 2pm by the time we gave up and we had to find a place to eat. I checked my iPhone and found that most of the restaurants were located on 7th Avenue, a few blocks down Union Street. When we turned down 7th Avenue, there were two immediate choices, an Indian restaurant with tablecloths or a local pizza place. The kids were starving, so we opted for the pizza. I told Doug, "You can't go wrong with pizza in New York." Since I grew up in New York, I know that for a fact. It was the harshest thing about moving to Massachusetts; all the pizza here is BAD. OK, some of it is passable, but the majority of the greek pizza here has no resemblance to the New York kind. We ordered a large pepperoni and spinach pizza and figured we could order more if we were still hungry. When it arrived, it was huge! As I was setting up the slices for the kids, my mom exclaimed, "This is the best pizza I've ever had in my life!" And then Doug, with a mouthful of pizza, nodded vigorously in agreement. I finally sat down and sunk my teeth into a perfect thin crust, fresh tomato sauce, sauteed spinach with lots of garlic, pepperoni and stringy mozarella cheese. It was sublime! This huge pizza fed all five of us and we even had a slice leftover. We fed our entire family plus Grandma for only $20!! We thanked the chefs and told them it was delicious. They just nodded as though they heard it all the time. I later checked the other Indian restaurant on Google maps and it only got 2 stars. So this pizza place was an excellent choice all around. It made the trip into the city worthwhile, although we were stuck in unbelievable traffic on the way home. Now Doug finally understands that pizza in New York is totally different from what is passed off as pizza in Massachusetts. 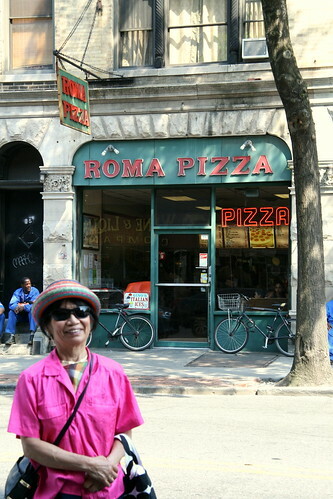 If you're ever in Brooklyn, NY, visit Roma Pizza at 85 7th Ave. You won't be disappointed! For more secrets behind Wordless Wednesday, visit Tell Me Thursday.